Western Field Ornithologists proudly presents the first publication in its new monograph series, Studies of Western Birds. 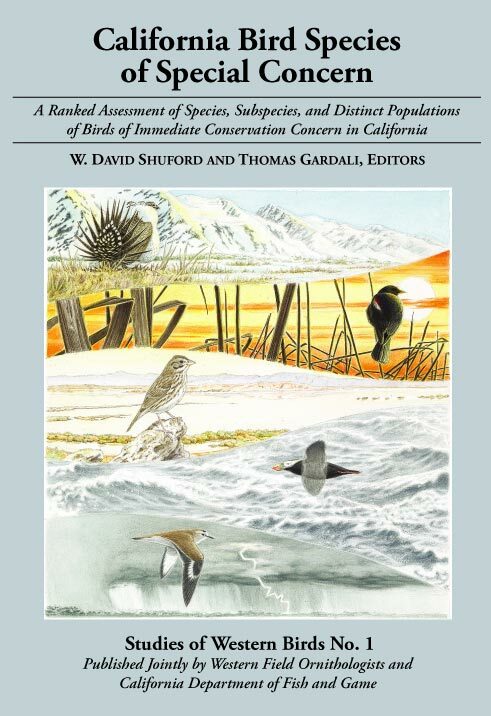 This volume — California Bird Species of Special Concern: A ranked assessment of species, subspecies, and distinct populations of birds of immediate conservation concern in California — is edited by W. David Shuford and Thomas Gardali of PRBO Conservation Science, co-published with the California Department of Fish and Game, and involved the contributions of many WFO members. Copies of this historic volume are no longer available in print but the full content in PDF format is available online for free here. What do the Purple Martin, Burrowing Owl, Least Bittern, and Grasshopper Sparrow have in common? These bird species and seventy others have the distinction of being included in the newly published California Bird Species of Special Concern: A Ranked Assessment of Species, Subspecies, and Distinct Populations of Birds of Immediate Conservation Concern in California, a collaborative project of PRBO Conservation Science, the California Department of Fish and Game, and Western Field Ornithologists. The book, the first full-length assessment of all of California’s sensitive species, will be of value to every field ornithologist, conservationist, wildlife biologist, biological consulting company, and planner in California. Within the 450 pages of the book, the authors provide a summary of the status of California’s at-risk bird species using the latest data to describe current populations, ranges, and threats. Birds of all types, including seabirds, raptors, shorebirds, waterfowl, and perching birds are represented on the list. Habitats with high numbers of special concern birds include wetlands, scrublands, grasslands, and riparian forests—all habitats with the highest rates of loss in California. The California Bird Species of Special Concern is an important step toward raising awareness of the conservation needs of California’s birds among the public, conservationists, biologists, and planners in California. This volume can help prioritize and guide how research and conservation projects are conducted to ensure that the birds and habitats we all depend on survive into the future. Major support for the production and printing this book has been generously provided by California Department of Fish and Game, Audubon California, BonTerra Consulting, EDAW, H. T. Harvey & Associates, Jones & Stokes, LSA Associates, The Nature Conservancy, PRBO Conservation Science, SWCA Environmental Consultants, and Western Field Ornithologists. Funding and donations from these and other sources have substantially lowered the cost of the book. Click here for a sample account of Tricolored Blackbird authored by Edward C. Beedy. Last updated: April 11, 2019 04:39 pm PDT. © 2019, Western Field Ornithologists, All Rights Reserved.